The China Beat: Can China Go High-Tech When Exports Slump? As the financial Tsunami batter China’s exporting hubs, everyone is wondering how well China can weather the storm in the next couple of years, but a more important question is how China’s economy will emerge after the crisis. As a result of extensive research, I argue that there have been sustained forces pushing China’s industry to more innovative fields with a stronger orientation to the domestic market. The crisis will only strengthen the shift in a more dramatic manner. This conclusion is based on my research in Beijing’s Zhongguancun, a region dedicated to innovative industry and domestic market. I started to do research in Beijing’s Zhongguancun in 2000, at a time when few foreigners had ever heard of the place. But most Chinese had, due to the hype from the official media that Zhongguancun was going to become China’s Silicon Valley. Yet, knowledgeable Chinese knew that Silicon Valley had grown up around such technology giants as Intel, HP, or Google. Zhongguancun, in contrast, seemed to be a collection of gigantic electronic markets and untold numbers of venders parading pirated CDs. They are very skeptical of this government claim. Undaunted, I continued to collect information and interview all sorts of companies in Zhongguancun, private, foreign-owned, state-owned, returnees owned, and I found that there indeed was more to Zhongguancun than meets the eyes. I had grown up in this region in the 1980s and witnessed its first transformation from a quiet suburb of universities and research institutes to a bustling high-tech commercial center. By 2000, it was gathering energy again with the internet boom. 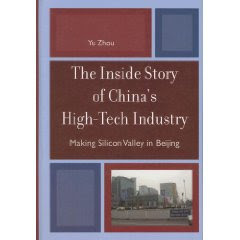 My fascination and research in this region lasted for six years and resulted in a book: The Inside Story of China’s High-Tech Industry: Making Silicon Valley in Beijing. Today, Zhongguancun is still far from Silicon Valley, but it has put its name on the international map. A number of companies started there have gained international attention, such as Lenovo and Baidu, and venture capitalists from California flood into China’s most promising land for innovative business today. In my book, I challenge the prevailing view that foreign multinational corporations (MNCs) and export are the driving forces for technological progress in China. I argue that indigenous companies are likely to be the future technological leaders in China. The most successful of them have taken advantage of their understanding of the Chinese market with their access to competitive, reliable, and high-quality component suppliers—the same suppliers for MNCs in exports. The synergy between China’s massive export facilities and rapid growing domestic market allowed Chinese companies to make special designs, pricing and marketing methods that worked best within China to beat foreign brands competition. This is the common story of Lenovo, Huawei and many other successful Chinese high-tech companies. More significantly, the growth of Zhongguancun is not marked by the emergence of a few strong firms, but by succeeding generations of them. The first wave was the spin-offs from universities and research institutes in the mid 1980s. These were primitive commercial companies with extremely limited international contact. But they managed to take over the lead of China’s high-tech commercial development from state-owned sectors, and firmly set China in the global technological mainstream. The second generation was computer hardware manufacturing firms such as Lenovo, which was able to establish its domestic leadership amid strong foreign competition in the mid 1990s. These were followed by internet startups in the late 1990s to 2000s, which to this day dominate China’s internet market in every category. The current wave is much more diverse, including multimedia firms, chip design, software export and other more technically sophisticated companies, often started up by overseas returnees with overseas venture capital. Each generation has gained more technical, management and capital competence, and each followed more closely the tidal waves of the Chinese market and global technological trends. Zhongguancun’s development is a fascinating story, with many colorful characters and successions of generations over a brief period and, though my book is academic in nature, I have attempted to capture this lively story with ethnographic details that heighten the book’s readability. 1. Foreign multinational firms (MNCs) have limits in bringing technological transformation in China. Chinese firms have a competitive edge in their home market. We often assume that if a large multinational company, say HP or Google, are successful in America and elsewhere, then they should also be successful in China. If they are not, we blame the Chinese government for creating an unlevel playing field between Chinese and foreign firms. But the reality is that China is a vast, regionally fragmented, rapidly evolving and largely low-income market. It is challenging for MNCs to reach beyond China’s affluent core. In contrast, Chinese domestic firms understand their home court better and have greater commitment and flexibility. They are also learning fast from MNCs in China. While they certainly are not on the cutting-edge, they have been extraordinarily effective in bringing new technology to the Chinese market at an affordable price. Their learning ability should not be underestimated. 2. The key constraint for Chinese companies to produce cutting-edge innovation is the Chinese market, but this will change. Many believe that the lack of innovation by Chinese companies has to do with their low R&D capacity. This is only partly true. It is worthwhile to remember that almost all Chinese technological companies were built after the mid 1980s—which is when China’s technological industry began. Most have emerged only in the 1990s. The short history set them apart from existing business powerhouses in Japan, South Korea, and even India. But beyond the inexperience and capital and technical gap, the key constraint for Chinese companies to innovate is the Chinese market. Michael Porter in his book The Competitiveness Advantage of Nations argues that it is the quality of the domestic market that is critical for national competitiveness. A technologically sophisticated market pushes innovation by forcing companies to constantly upgrade their products. Yet Chinese consumers value low-price and lack experiences with many products. This means that most have yet to attach the same importance to the quality, design, and newness of products that consumers in advanced economies do. This provides little incentive and reward for cutting-edge innovation by domestic companies. It is not surprising, indeed it should be expected, that most Chinese companies concentrate on following the MNCs’ lead in making products cheaper and better suited to Chinese customers rather than blazing their own paths. But as the market evolves with sustained higher income and more sophisticated consumer tastes, one can bet that Chinese companies will evolve with it by offering more innovative products. 3. The competition between Chinese indigenous firms and MNCs is not a zero sum game. Observers inside and outside China tend to view the competition between MNCs and domestic firms as one side trying to eat the other’s lunch. But the prevailing pattern is actually a relationship of collaboration. Virtually no Chinese products are made without MNCs’ components. This is true for hardware and software. China’s most popular enterprise management software by UFIDA, a domestic company, has an Oracle database in it. As domestic companies cultivate and expand the market, MNCs have an enlarged consumer base for their products. MNCs also learned from local firms’ marketing expertise to enhance their market performance. For example, when Nokia and Motorola suffered setbacks from Chinese cell phone manufactures in 2002-04, they managed to regain the high-end of the market by adjusting marketing strategies in part modeled after local competitors. Overall, the increasing involvement of MNCs in China in the past twenty years has been accompanied by, and indeed dependent upon the growing competence of Chinese local companies. Some Chinese critics lament the lack of innovation in China and they imagine that if only Chinese scientists put their minds to innovation with ample state funding, innovation would take place. The truth is that given globalization and the lagging state of China, domestic companies cannot generate new technology unless they work with MNCs. Only MNCs can demonstrate how technology, marketing, and human resources are managed in the modern world. They provide Chinese companies with the knowledge of rules and skills the Chinese market has yet to provide. The technological dynamics displayed by returnee-founded enterprises nowadays exemplify how indispensible the international linkages are for cutting-edge innovation in China. 4. The critical role of the Chinese state is not to lead technological change, but to be an honest and responsible collaborating partner with other technological agents. Analysts tracking Chinese technological changes often regard the Chinese state as the decisive actor. Outside China, China’s success in economic development is frequently credited to the Chinese state policies, and Chinese failure in creating frontier technology breakthroughs is also blamed on its authoritarian system. Within China, some Chinese scholars believe that China has become too dependent on Western technology and China’s private sector is incapable of moving into long-term R&D, so they advocate a more direct role for the state. It is not uncommon to hear Chinese officials referring to China’s success in producing nuclear bombs and a satellite in the 1960s as a model for technological breakthroughs. Unfortunately, this argument shows little understanding of the difference between military and civilian technology, or of the reality of the global marketplace in which Chinese companies must operate. A nuclear bomb does not have to stand the test of open global competition; a computer chip does. China’s state-directed satellite and technology research prior to the mid-1980s had a very poor record in responding to market needs. Given the intensity of globalization today, a state-centered approach to R & D would be counterproductive, if not simply unfeasible. This is not to deny that the role of the state is instrumental. In China, as in other developing countries, the question is never whether the state should play a role in technological development, but how. Zhongguancun’s experience shows us the state’s crucial roles are not in being leaders, but in collaborating effectively with other technological agents and learning to reform regional institutions under changed circumstances. The accomplishments of China’s Silicon Valley thus far cannot be attributed primarily to the Chinese government. Domestic companies and MNCs alike have spent considerable energy pushing the state to change its resource allocation, ease its restrictions, and alter its regulations. Over the years, the Chinese state has largely been responsive and tolerant of the various experiments in the region, setbacks notwithstanding. But the state has not gone far enough. In the long run, genuine innovation can only come from freedom of thought, experimentation, collective effort, and frequent exchanges with advanced technological parties and marketplaces. All that will require the Chinese government to continue to collaborate with—rather than supervise or direct—other parties. Only then can a fairer and more open institutional structure for fostering innovation can be built. China’s path into high-tech will not be easy, but one should never underestimate the capacity of Chinese enterprises in learning and competing in their domestic market, which will eventually move them toward a more innovative trajectory. Yu Zhou teaches geography at Vassar College. Thanks for sharing this info, Richard.